In sea walk, you have a different kind of experience distinct from snorkelling and scuba diving. 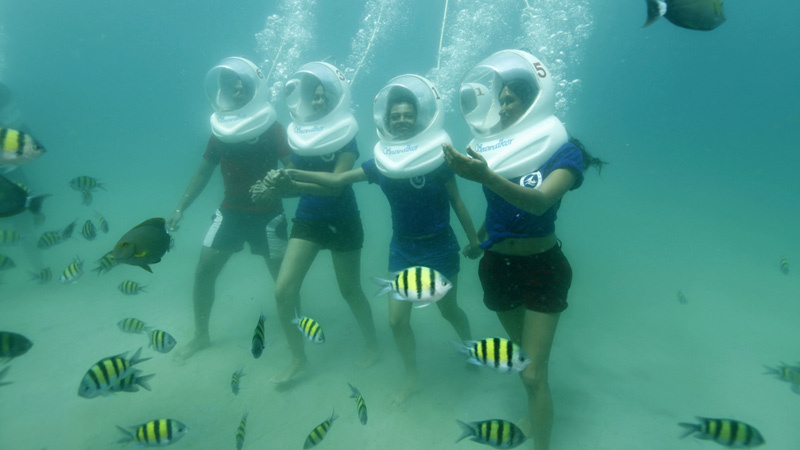 Sea walking in the beautiful coral reef fringes of the various islands of Andamans can be an invigorating experience. The sea walking expeditions are conducted under the vigilance of strict professionals. All measures of safety of tourists are taken into consideration. Usually the tourists and travellers are transported from the mainland of Andamans such as Port Blair to the sea-walking sites. The sea walkers walk underwater geared with a helmet provided with a transparent visor that is placed on the head. This is an apparatus that is designed to enable the sea walkers to breathe normally under the water. The sea walkers are escorted and guided by life guards who ensure maximum safety and convenience of the sea walkers. The experience of walking under the water on the ocean floor is in itself amazing. On top of that one enjoys the privilege of watching the flora and fauna from close quarters. The helmet serves to adjust the ear pressure and saves you from any kind of discomfort. The helmet allows normal breathing. The helmet is heavy so that you are pushed towards the ocean bed. Oxygen is supplied into the helmet from an oxygen cylinder which is kept in the pontoon overhead. Once underwater, the helmet does not feel heavy and since it is transparent, it offers a clear view of the watery surroundings all around. Some of the sea walking sites or beaches are extremely crowded especially during the tourist season and travellers and tourists have to wait in long queues for their turn. Usually, the enthusiasts are catered on a first come first serve basis. Water makes your body feel weightless and you glide through the water finding it almost difficult to keep a steady balance. People of any age starting from around 6 or 7 years to about 60 or even 70 years can actively take part in sea walking adventure. Sea walking is not recommended for people suffering from asthma and heart problems and for pregnant ladies. It is one of the most amazing walks that you would ever walk in your life. In sea walking, you walk with the fishes alongside you. You see the colourful fishes all around you as you lightly step on the ocean floor. You stop to appreciate the strange quaint beauty of the mystic corals. You add mirth and happiness to your walk with the strangest of strange sea animals breathing near you and watching you silently monitoring every step you take. The experience is aligned to the ecosystem as you don’t have to disturb the water ecosystem simply for deriving fun out of it. Care is taken not to touch or harm the quiet and peaceful water kingdom. The sea walking in North Bay Island is very well organized in spite of the peak-hour rush that that it faces being situated so very close to Port Blair. Sea walking sessions open here at 9 a.m. in the morning and continue till 10.30 a.m. Again after a break of 1 hour it continues from 11.30 a.m. to 1 p.m. The waters of the North Bay Island seem to form a natural aquarium. The site for sea walking is netted to make your experience safe. A stationed platoon or an anchored boat is set off the coast some distance off shore. This is the point from where the sea walking is conducted. The adventurers are briefed initially on the technique. Havelock Island in the Andaman seas is one of the chief tourist attractions. The sea around the Havelock Island is beautiful aqua blue to navy at some places and sometimes a shimmering blue-green colour. The Elephant Beach of Havelock Island is very famous for all kinds of water activities. The beach is surreal with white fine sands and sparkling blue waters. The waters off the coast of Elephant Beach in Havelock is ideal for sea walking on account of the rich flora and fauna in the colourful coral reefs. The variety of corals seen in these parts is truly incredible. Also the beautiful species of sea animals playing on the coral reefs is equally incredible. Sea walking opens up doors to this rich underwater life and one can experience the beauty of the ocean bottom that is otherwise hidden from the eyes of the world. In order to plan for a sea walking adventure either in Havelock or North Bay Island one has to book in advance.